Below is a simple and clear approach to immunofluorescence. There are 3 common fixation methods listed below that are proven and effective for a multitude of adherent and suspension cells. 1% formalin PBS is a good starting fixation method. For a typical slide, it takes ~300 microliters to cover an area equal to 2 coverslips. I) Culture cells to 50-70% confluency. Some cells (endothelial/epithelial) may require a higher level of confluency. For suspension cells in a regular petri dish or flask, transfer enough cells suspended in medium to each well of a poly-D-lysine-coated microslide. Then Incubate microslide in CO2 incubator from 1 hour to overnight to allow cells to attach to the bottom of the slide. The incubation time varies depending on the suspension cell used. Check for cell attachment using a microscope. Gently aspirate medium from the wells, wash the attached cells briefly with 1x PBS and proceed with the Cell Staining Procedure of choice. II) Fix the subconfluent cells appropriately, followed by 2 PBS washes (dipping the slides gently into separate beakers of PBS is one way to wash). Optional step: Antigen retireval (see below). III) Blocking: Gently pipet 10% BSA, PBS onto the slide and incubate for 30 minutes rt. IV) Primary Antibody Incubation: 1:50 in 2% serum/PBS for 60 minutes at room temperature followed by 3 separate and gentle PBS washes. V) Secondary Antibody Incubation: 1:100 in 2% serum/PBS for 60 minutes at room temperature followed by 3 PBS washes and 1 dH2O wash.
At this point prop the slides at an angle to allow them to partially dry. (You will see liquid evaporate slowly off slide when faced up. Wait for all liquid to evaporate and then add the mounting medium) approximately 5 ul drop (no air bubbles) to each area (8 areas for 8 well plates) Gently drop the coverslip onto the slide and align. Allow it to settle. Place mounted slide in light proof box and place in 4 degree overnight priot to performing the visualization. Visualize under the appropriate fluorochrome filter. The methanol fixation is an easy method; however, it frequently solubilizes and removes membrane bound antigens. By a simple precipitation of the protein, methanol only provides low structural preservation. Rinse the cover glass with PBS. Fix cells by incubating the cells in pre-cooled 100% methanol at -20 oC for 10 min. Higher polymers, which are initially insoluble, are sold as a white powder known as paraformaldehyde. The concentration of formaldehyde in compound fixatives varies widely - ranging from 0.5 to 15% w/v. The majority of fixatives using formaldehyde have a concentration of between 2.5 and 4% w/v. Rinse cells with PBS at room temperature. Fix in 3-4 % paraformaldehyde in PBS for 10-15 min at room temperature. Wash 3-times 5 min each with PBS containing 100 mM glycine. Permeabilize cells with 0.1-0.2% Triton X-100 in PBS for 1-20 min. The liquid known as formalin contains 37-40% of formaldehyde and 60-63% of water (by weight), with most of the formaldehyde existing as low polymers. Fix in 1 % Formalin in PBS (prepared from 10% buffered formalin PBS) for 10-15 min at room temperature. Rinse three times with PBS. Cut 5 to 8 micron thick cryostat sections of tissue block. Allow frozen sections to come to room temperature (~60 minutes). Low adhesive phenotype or suspension type cells may require additional care for labeling on a solid phase. Poly-D-lysine (PDL) or collagen coated plates/slides can enhance cell binding due to the creation of a uniform net positive charge. This type of coating can enhance cell attachment, growth and differentiation. PDL coated surfaces can reduce cell detachment from shear stress in washing steps associated with cell labeling. Suspension cells can be centrifuged onto glass slides. Cytospin technique utilizes a single layer of cells that are deposited onto a clearly-defined area of a glass slide. The slides are designed such that a "filter card" absorbs the excess fluid from the cells. This technique deposits the cells for nuclear presentation. Cytospin has many variables; rpm, time of spinning, and cell concentration - and these variables will determine the quality and cell morphology of the prep. For this reason, Smearing suspension cells onto coated slides may be a favorable technique. 4,6-Diamidino-2-phenylindole, 2HCl for DNA labeling. DAPI is a nuclear counterstain for use in fluorescent techniques. The blue fluorescence stands out in contrast to green, yellow or red fluorescent probes of other structures. DAPI preferentially stains dsDNA; it appears to associate with AT clusters in the minor groove. Binding of DAPI to dsDNA produces a 20-fold fluorescence enhancement, apparently due to the displacement of water molecules from both DAPI and the minor groove. The following protocol is used for staining of tissue sections or for staining cultured cells on slides. Working concentration: 0.1 to 1 µg/mL DAPI. Staining Pattern: Nuclei will be stained bright blue. 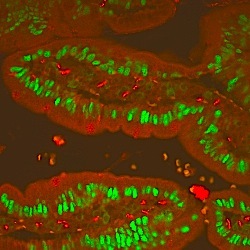 Suggested Use: Counterstain for immunofluorescence when green (FITC) or red (Texas Red) fluorescent marker is used. Mix to dissolve; it may take some time to completely dissolve. Aliquot and store in –20 ºC. Store this solution at 4ºC in brown bottle or wrapped with aluminum foil to protect from light. Incubate sections in dark for 30 minutes at room temperature. Following reconstitution, aliquot and freeze (-20C) for long term storage or refrigerate (+4C) for short term storage. Stable for 1 years as supplied. Stock solutions stable for several weeks at +4C or for several months at -20C. This is a simple method for antigen retrieval on aldehyde-fixed cryostat tissue sections or cultured cells. 5 minute pretreatment with 1% sodium dodecyl sulfate (SDS) may produce a dramatic increase in staining intensity by immunohistochemistry and immunofluorescence. Rinse sections three times for 5 min each in PBS. Cover sections with 1% SDS solution and incubate for 5 minutes at room temperature. Rinse sections three times for 5 min each in PBS. It is important to wash sections well, otherwise residual SDS will denature the antibodies subsequently applied to sections. 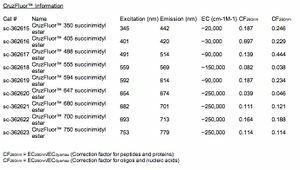 Incubate sections in serum blocking solution. Incubate in the primary antibody and complete immunohistochemical staining steps as desired. Incubate sections for 30 minutes in 0.05% saponin in deionized H2O at room temperature. Wash at least three times in PBS. Aspirate excess liquid from slides. Try to filter it out during image acquisition; difficult due to the broad emission spectrum. Natural fluorescence can arise from substances like flavins and porphyrins. These compounds can be extracted by organic solvents and aren't much of a problem in fixed, dehydrated sections. There appears to be some "background" fluorescence in tissues if the laser aperture is high enough, particularly in broad-band blue excitation. Narrow-band filters and lower wattage (50 rather than 200) mercury lamps can reduce this. Natural fluorescence can be helpful in highlighting tissue structure. Lipofuscin is the breakdown product of old red blood cells – an “aging” pigment. 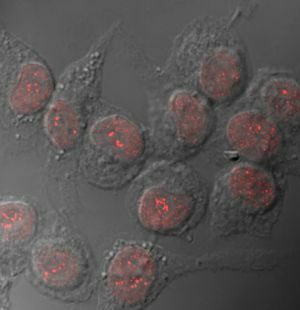 It usually occurs as small, punctate intracellular structures that are strongly fluorescent under any excitation ranging from 360nm to 647 nm. The colour should appear orange under UV excitation, green or yellow under blue excitation, or red under green excitation. Lipofuscin, should be less prevalent in younger (e.g., early adult) animals. Typically from blood vessel walls. Elastin contains several fluorophores. There is a similar fluorophore to that found in collagen.Nearly all vessels on the arterial side of the circulation have an internal elastic lamina that lies between the endothelium and the innermost layer of smooth muscle cells. Elastin is fluorescent over a range of excitation wavelengths. Most of the extracellular material between the smooth muscle and in the adventitia layer is collagen which is also autofluorescent. Aldehyde fixatives react with amines and proteins to generate fluorescent products in long-pass green emission (GFP, FITC, Alexa488). Glutaraldehyde is more intense than formaldehyde. The simplest way to stop aldehyde-induced fluorescence is to use Formalin or PFA rather then glutaraldehyde. Glutaraldehyde exists as low polymers that reacts with and cross-links protein molecules,and produces free aldehyde groups in the process. These tissue-bound free aldehyde groups will combine covalently with any amino group offered to them, including terminal and side-chain (lysine) amino groups of proteins being used as histochemical reagents; primary antibodies, all lectins and all enzymes. A highly specific monoclonal primary antibody may bind at sites that contain basic proteins but not the antigen you're after. Aldehyde-induced fluorescence in summary is due to reaction of free aldehydes with tissue components. Glutaraldehyde is more prominent than formaldehyde; and the effect is compounded when fixation is longer or warmer. Fairly uniform, non-punctate fluorescence distribution across tissue may be brighter in some cells than others depending upon the presence of biogenic amines. Aldehyde Blocking can minimize aldehyde-induced fluorescence by reducing the -CHO groups to -OH with sodium borohydride. Immediately before use, make up a 1 mg/ml solution of sodium borohydride in a physiological buffer such as PBS. The solution will be fizzy like carbonated water. Preparing this solution on ice and performing all subsequent incubations on ice has also been recommended. Apply this solution immediately (while fizzing) to cells or tissue sections. For glutaraldehyde fixed cell monolayers incubate in the sodium borohydride solution for 4 minutes. Replace with fresh sodium borohydride solution for another 4 minutes. For paraformaldehyde fixed paraffin embedded 7 µm sections incubate 3 times, 10 minutes each in sodium borohydride solution. For thicker tissue sections, more changes of sodium borohydride solution and/ or longer periods of incubation might be necessary. Rinse many times with PBS to remove traces of sodium borohydride. Continue with blocking steps at this point. Discard any leftover sodium borohydride solution as it loses its reactivity with time. Bleaching and photostable are relative; CruzFluor are comparable to Alexa. This page was last edited on 23 January 2019, at 12:24.